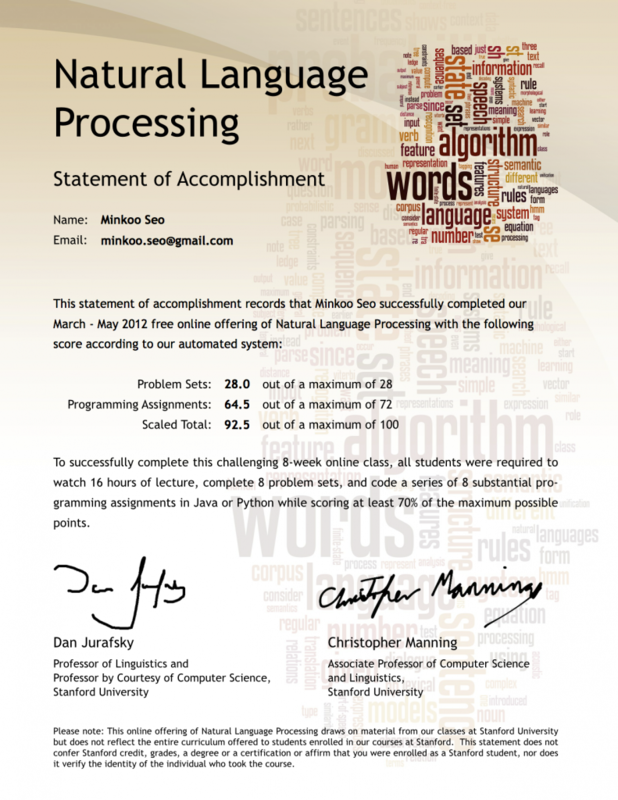 After finishing 8-week of homeworks, lectures, and programming, I finally received my statement of accomplishment from nlp class, coursera. Now, I’m taking http://ml-class.org/, and wish more people can take these special opportunities. Did you receive it by mail or just by e-mail? I got it by email in pdf. Thanks! Did pay any fee for the certificate or it is free of charge? It’s free of charge for sure. All course on coursera is open to everyone. 저는 최근에 NLP에 대해 호기심이 생긴 신참이에요^^; 본래 Coursera에 있던 이 코스를 한번 들어보고싶었는데 현재는 이용이 불가하네요. 유투브에 비디오만 업로드가 되어있더군요. 혹시 비디오만 보는 것과 블로거님께서 정식 수강하신 것처럼 과제를 함께하는 형식에 갭이 클까요? 분야 전문가 이신듯한데 (^^) 다른 추천 자료가 혹시 있을지도 궁금합니다. 고맙습니다!